If you enjoy hunting, or, on the more aesthetically pleasing side, bird watching, there is a piece of equipment that is essential. That necessity is a spotting scope. We also know that Bushnell is an exceptionally well-known brand for their quality. To be frank though, the Bushnell Legend Spotting Scope certainly does not disappoint. This scope was built on the same principles as Bushnell’s Legend ultra HD binoculars. Essentially, the Legend Spotting Scope delivers exceptional field performance at a decent price. 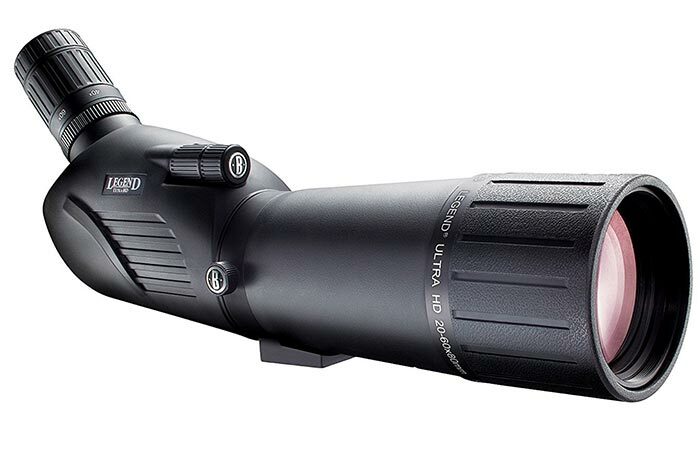 At its basics, the Legend Scope features ED Prime Extra-Low Dispersion glass, fully multi-coated optics, and Bushnell’s patented RainGuard HD water-repellant coating. The ED Prime glass was used to produce a precisely color-tuned, high resolution view. This means that this scope delivers only superb clarity and color, even in low-light conditions. Check out the video below. This scope features 2 different setting dials. One on the eye-piece for quick adjustment and another on the scope for fine tuning. In addition to this, the multi-coated lenses result in reduced light-loss and glare from reflection. This results in a higher contrasted and brighter view without placing any eye strain. If you were worried about the weather, there is no need. Besides the above-mentioned qualities, the RainGuard HD coating protects your view by dispersing water from large drops to microscopic specks. This makes it perfect to use in conditions that range anywhere between rain to snow, and even, sleet or condensation. Furthermore, the Bushnell Legend has a zoom of 20 to 60 at 80mm. It also has a field of view of 110 feet at 1000 yards (20x) and 51 feet at 1000 yards (60x). It also comes with a soft carrying case. This scope weighs in at 80.1 ounces and measures 16.5 inches.